Flowers single, in groups of four at tips of shoots, flowering shoots very densely crowded towards ends of branches; corolla c. 9mm long, white, slightly curved, widening towards mouth; calyx segments unequal, with broad translucent margins and pale green mid-rib, lobes c. 3mm long, c. 1.5mm broad; anthers brown; style to 9mm long prominently emerging from corolla, style end green when fresh; nectar profuse. Seedling 05-2-20 raised by K. Kramer in 2005, F2 seedling of self-pollinated 'Mr Robert'. 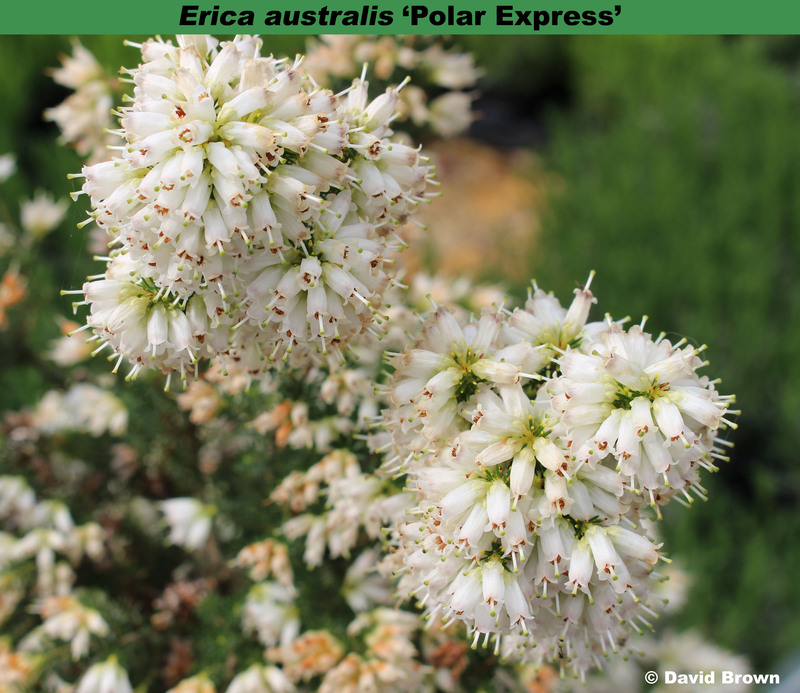 Selected and named by David Edge in 2016 after cultivation in Forest Edge Nurseries. Hardier than other clones of E. australis having survived a frost test as a seedling in Germany. Distinguished from 'Mr Robert' and 'Holehird White' by green style end.